Until the late 1980s, the current location of Glasgow Caledonian University was known as Glasgow College of Technology. Upon sorting and listing recently, I came across several issues of Techbeat – the magazine for and by the students of GCT. 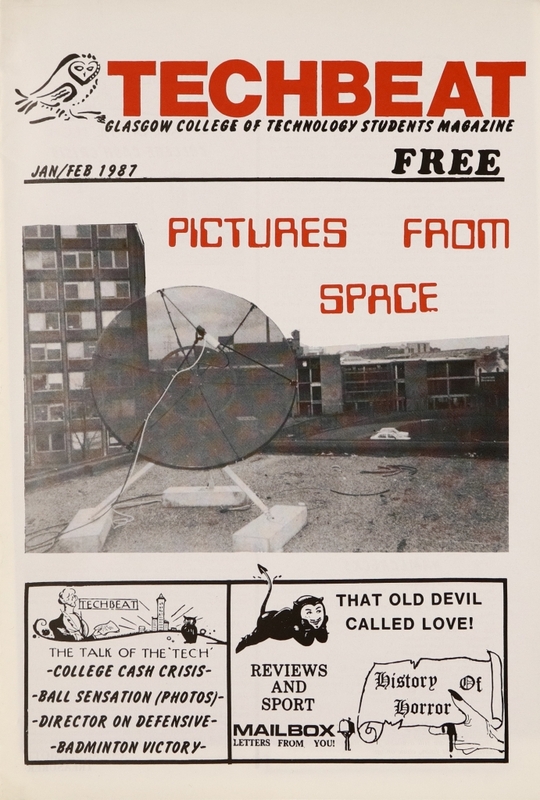 The student union magazine is a venerable staple of many higher education institutions. They were (and are) a chance for the student body to put its point of view across, to cover the issues that they find relevant, and hold power to account. To read one is to be exposed to a specific mind-set of youthful idealism mixed with scabrous humour. Today, in our political song collection at GCU Archives, Christy Moore can be found featured on an STUC centenary album released in 1996 entitled, ‘If it wasnae for the union’. Politics is a strong theme throughout the issues. 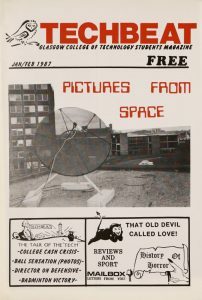 In the days before Twitter and Facebook, magazines such as Techbeat were a particularly valuable resource for engaging with young people and disseminating facts and opinions. One of the most contentious issues of the day was the racist regime in South Africa and the international response towards it. It is fascinating to look back and read contemporaneous opinion pieces excoriating the Government of the day. In the present, the sheer breadth of the movement can be witnessed at GCU Archive Centre where the records of the Anti-Apartheid Movement Scottish Committee are kept. In other, lighter ways, the differences between now and then are clear. The November 1986 issue contains a piece of reportage, ‘Confessions of a College Blob’ about the writer’s attempt at exercise, with jogging apparently the preserve of those ‘one notch above leper’ in social standing. Contrast to modern day GCU and all those health conscious folk sweating away in the Arc! Today, The Edit has an enviable online presence, replete with a sleek website and social media channels. Techbeat was a more modest affair. Barring a splash of red on the front page, the entire magazine is in black and white. The photographs are grainy, and the lack of word processors and spellcheck means typos regularly slipped through the editing process. To these eyes, this only furthers the magazine’s ramshackle charm, as do the cartoons dotted throughout. What truly shines through is the dedication and commitment of all of the staff. Their passion, wit, and heart on sleeve convictions bleeds through onto every page – a fitting testament to the institution they represented. Founded in 1971, Glasgow College of Technology went onto be renamed Glasgow College, then Glasgow Polytechnic. 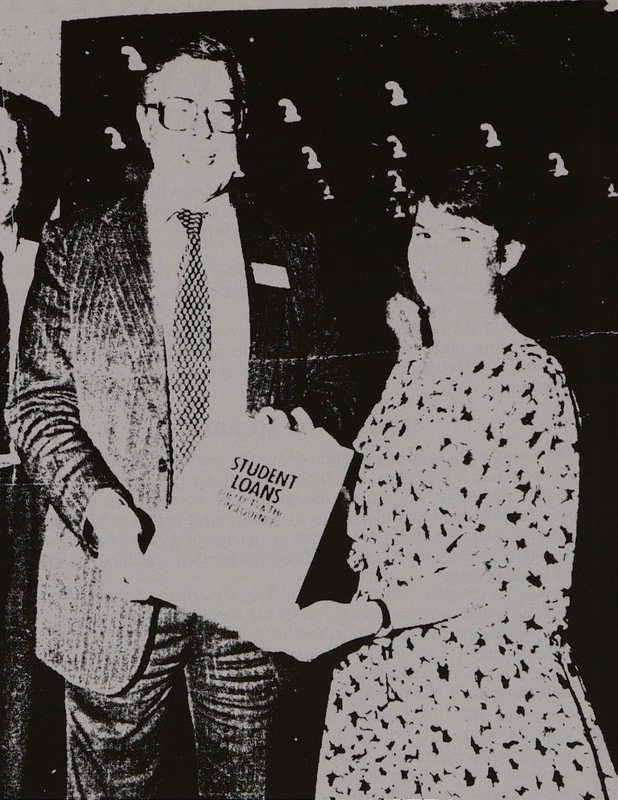 In 1993, it merged with the Queen’s College to form Glasgow Caledonian University. If you are interested in listening to this CD, an appointment can be made for our Reading Room. Thus somewhat undermining the argument of one writer who, in reference to the 1986 Commonwealth Games in Edinburgh and the decision by some African countries to not compete, proclaimed themselves ‘firmally against the boycott’. This entry was posted in Archives and Special Collections and tagged GCU archives. Bookmark the permalink.